Rux Martin/Houghton Mifflin Harcourt, 9780544133334, 288pp. Paul Lowe, who was born in Oslo, has been a food and craft stylist for more than twenty years. His work has appeared in Real Simple, Parents, Better Homes and Gardens, Country Living, Good Housekeeping, Cooking Light, Food Network, and Cosmopolitan. "Home cooks who love both kitchen couture and innovative simple cuisine now have a cookbook to 'sweeten their everyday life.' 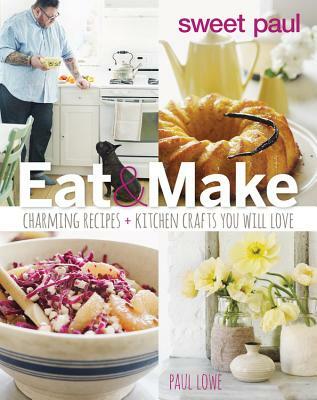 [Lowe] presents in stunning images both a collection of easy projects...side-by-side with delicious recipes. When it comes to creating a homey and fashionable kitchen table, Lowe proves that the combination of whisk and glue gun adds a touch of charm to everyone’s kitchen." "Dishes such as breakfast churros with cinnamon sugar and chicken with olives and capers look luxurious but are relatively inexpensive and easy to make. Similarly, simple crafts that include fork bookends and vintage-photo napkins offer maximum fun for minimal cost. VERDICT: As its title suggests, this beautifully designed and approachable cookbook is a call to action, not just something pleasant for the eye."